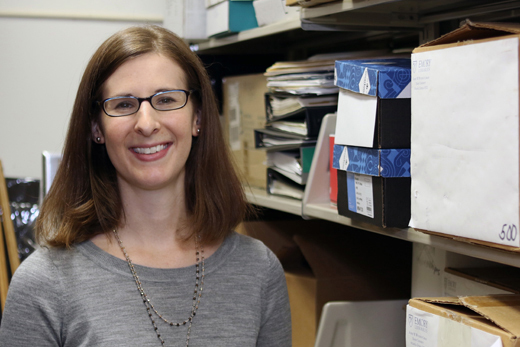 Anita Vannucci, Emory's Records Management program archivist, stands in one of the many near-capacity storage closets across campus. Vannucci will lead a free records management workshop Nov. 16 and Dec. 9 to help campus offices learn what to keep and what to destroy. Credit: Emory LITS. A one-hour workshop, "An Introduction to Records Management," will be offered on Monday, Nov. 16, at 10 a.m. and Wednesday, Dec. 9, at 2 p.m. in the Teaching and Learning Studio in the Rose Library (Level 10 of Emory's Woodruff Library). Registration for the workshops and more information can be found on the Records Management training page. Additional dates and workshops will be scheduled in the spring. If your Emory University department or office is getting buried under boxes of old files or drowning in bytes of information, help is available from Emory's Records Management program. You can learn what to keep and what to destroy by scheduling a site visit to your department or registering for a records management workshop on Nov. 16 or Dec. 9. Vannucci is available to provide training on best practices, make a site visit to assess records and offer recommendations, help set up an account with Emory's off-site storage vendor, and advise on preparing and transferring permanent records to University Archives. She has already conducted numerous department visits and presentations on best practices since she started the job in March 2015. Emory's Records Management website, records.emory.edu, provides information on setting up an office records management program, including best practices for retaining, storing and disposing of records in both paper and electronic format. The retention schedule is currently under review to ensure consistency with state and federal requirements, Vannucci says. In the meantime, she encourages departments to contact her if they discover areas in need of an immediate update. The Records Management program works closely with University Archives to preserve records of permanent value that document Emory's history, such as meeting minutes, policies, annual reports and executive correspondence. Both Records Management and University Archives are part of the Stuart A. Rose Manuscript, Archives, and Rare Book Library. Yolanda Cooper, Emory University Librarian, says the records management program that the university and the libraries are building together will be valuable to the institution as a whole. A one-hour workshop, “An Introduction to Records Management,” will be offered on Monday, Nov. 16, at 10 a.m. and Wednesday, Dec. 9, at 2 p.m. in the Teaching and Learning Studio in the Rose Library (Level 10 of Emory's Woodruff Library). Additional dates and workshops will be scheduled in the spring. Registration for the workshops and more information can be found on the Records Management training page, under the in-person courses tab. For self-guided help, the Records Management website contains information on setting up an office program, managing department records, preparing for off-site storage and records destruction, and other topics. Online training consisting of short videos on topics such as best practices in records management will be accessible on the website next semester. Emory University has a contract with Access Information Management to provide off-site records storage. About 200 offices and departments across the university use Access. Currently, Emory has about 20,000 boxes in storage with Access. “That doesn't sound like much, but a lot of those are undescribed and unlabeled, which creates a lot more work,” Vannucci says. She estimates that about half of what's in storage is eligible for destruction — another reason it's important to label boxes headed to storage with a date range and description of the materials, and the date the contents can be destroyed. Even for those departments who use Access rather than a spare room down the hall, there's still some confusion about what to keep at the off-site storage space – Vannucci says she's seen holiday decorations among the Emory boxes – and not everyone is following procedure. Records stored in a non-climate-controlled storage space, such as at the Briarcliff property, are susceptible to problems such as humidity, mold, bug infestations and water damage, issues the Emory Libraries' Preservation Office has dealt with in the past. Vannucci can help Emory departments set up their Access account and use the online portal, where a list of contents in storage can be tracked on the vendor's website – provided the boxes are labeled. To make arrangements for a department visit or for more information about Emory's Records Management program, contact Vannucci at 404-727-6900 or anita.vannucci@emory.edu.